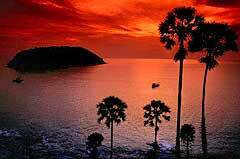 Which is situated in a tropical forest and is the highest mountain in Phuket. Chalong Temple which is an ancient sacred temple visited by Phuketian people. There are many crowds on the cape, so you should go early to the cape. Khao Rung is located at the back side of Phuket Town.